In creating our beach theme bedroom, we took our inspiration from the seaside with a view to creating a room that is light and airy. We hoped to create a room that was calm and reminiscent of long, pleasant days by the beach – whether your own beach bedroom is by the sea, in the city, the suburbs or even the countryside. We wanted the room to reflect the beach and all that we associate with it, rather than to mimic the coast line literally. We have added one or two pieces that give you the opportunity to really add the “beach” to this room, but they are just subtle hints and one of these items provides you the opportunity to add some of your shoreline (yes, I am talking about literally adding a piece of it!) if you want to. We wanted this room to be timeless and have not gone for ultra contemporary pieces here. Instead, we have chosen furniture and accessories that are inspired by traditional design but that have a modern look. We hope you enjoy it! This classic white sleigh bed with comtemporary detailing is the white bed chosen for our white beach theme bedroom. 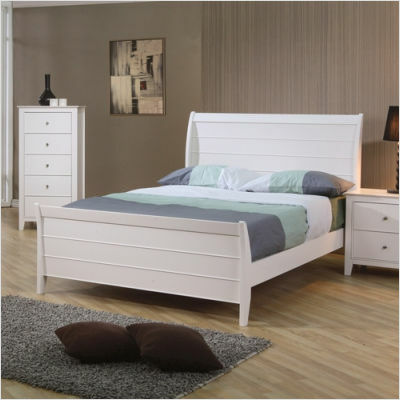 Whether you are creating a beach style or just looking for a new white bed for your bedroom, this bed makes a stylish choice. As I have said before, choosing white furniture gives you lots of flexibility if you decide to change your design scheme in the future.More…. 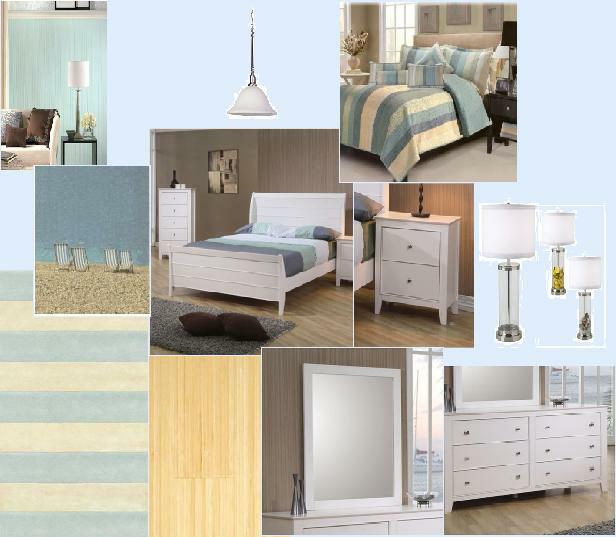 Believe it or not I had chosen this Morroccan Stripe Comforter Set for our beach style bedroom before finding out that the manufacturer describes the coloring of this particular set as “Ocean”! Now I prefer to think this is a case of great minds, rather than……! I just felt that the combination of soft blues and neutrals would give a subtle richness to the choice of bed linen and the overall look of the room. It incorporates the colors that we associate with the ocean without being overpowering. More…. This white nightstand is from the Wildon Home Twin Lakes collection to match the other pieces of white furniture that I selected for this bedroom – just to give you a nice co-ordinated look! While some design schemes require furniture that is contrasts or that compliments without matching, I believe that this scheme will benefit from the choice of matching pieces. A nightstand is a great place to position your bedside lamp and to store personal items or that book you just don’t have time to read during the day! 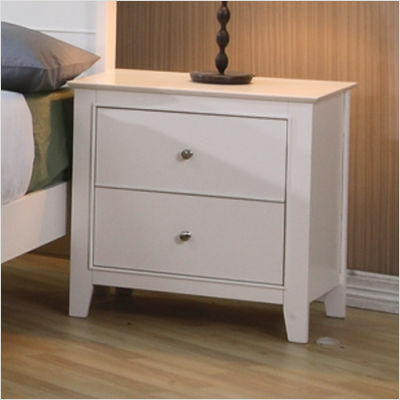 This nightstand has two drawers – if you have an “other half ” you might want to get one each so that you don’t have to share! Otherwise just make sure that the nightstand is on your side of the bed – possession is 9 tenths of the law after all! More…. 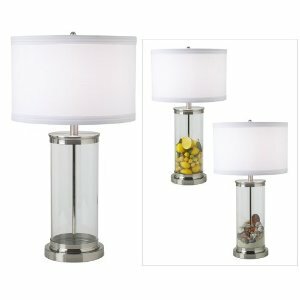 This Fillable Glass Cylinder Collector’s Table Lamp is the bedside table lamp I have chosen for our beach style bedroom. As it comes it is quite a classic style bedside lamp but if you want to explore the beach theme further, the base of this lamp can be filled with sea shells or pebbles to create a real beach look. If you have kids or grandkids, you will have a great excuse to explore the beach and find some treasures to fill the lamp or indeed to use some of those seashells that have been collected on a previous trip and are laying around the house desperately in need of a home! Just be careful….. More…. This white dresser is part of the Wildon Twin Lakes collection and I have chosen it to match the white sleigh bed chosen for our white beach room design. This dresser features 6 drawers for storage of clothes, lingerie and all those bits and pieces that we love to collect but that can clutter up our space if they don’t have their very own home! 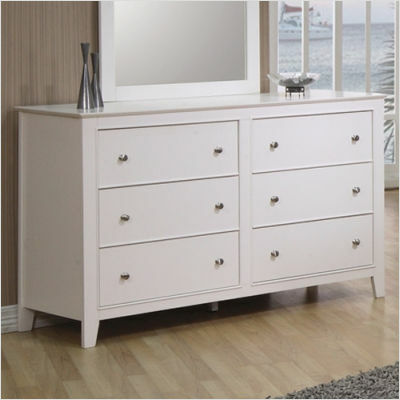 As with the other pieces of this collection, while it works beautifully for a beach style room, this dresser can fit in with many design schemes. More…. 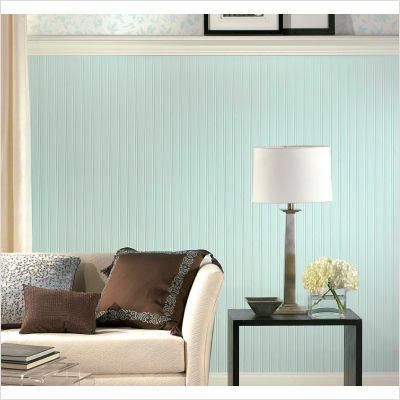 This beadboard paintable wallpaper by Graham & Brown will fit perfectly in your beach style bedroom. You can choose your color to suit your taste and the overall design scheme. 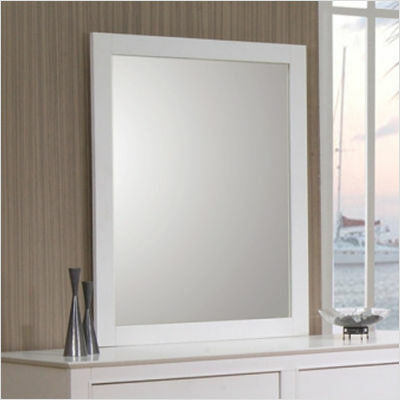 It gives the effect of beadboard wainscoting without the need for a carpenter or indeed the expense! This wallpaper will add character to your bedroom. I would suggest using it as it is shown in the image, below a dado rail with either a complimentary untextured wallpaper on the top or indeed you can simply paint the upper part of the wall. As an alternative….. More…. Given the high sustainability and environmentally friendly origins of bamboo, I chose this light colored bamboo hardwood flooring for this bedroom. I love the fact that we can use bamboo in our homes without any environmental guilt. 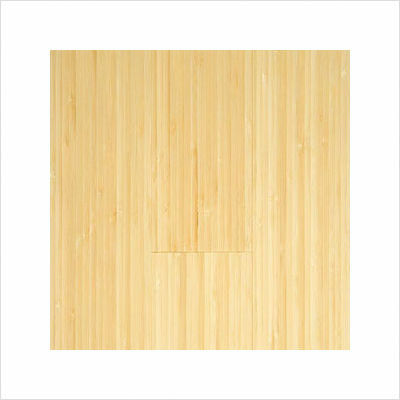 The light color of the Hawa Solid Bamboo floor chosen, will compliment the color pallette of the bedroom and is a great choice of flooring, particularly for smaller bedrooms. Whille I have chosen a light colored wooden floor here, it is important to remember that all wooden floors, in their natural colors, are considered neutrals. More….. This blue striped rug reminds me of the old style deck chairs with the striped seating, we used to see on beaches when we were kids – very young kids, of course! 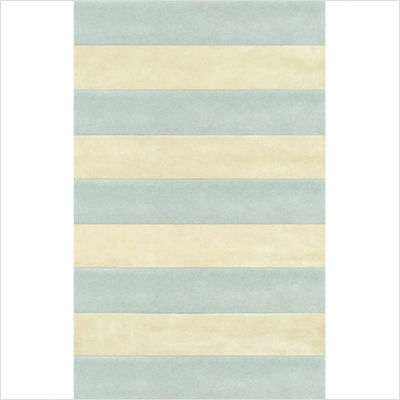 Like the comforter set I chose for the beach theme bedroom, I love the softness of the colors in this rug. They are still reminiscent of the pale blue waters and pale sandy beaches without being so “beach” as to take away the versatility of the rug. Where possible I think ahead when buying or recommending pieces – I will try…. More…. Ok, so this picture is perhaps a little more literal than my usual choices for artwork, but I am on a trip down memory lane and sentiment is kicking in. 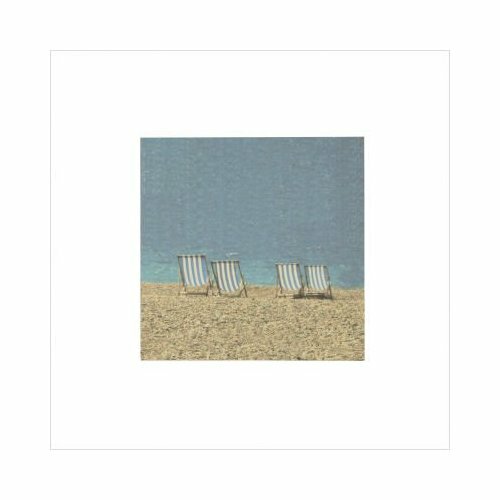 As I said, the rug I chose for this bedroom, reminded me of the very deckchairs featured in this piece, so I just couldn’t resist including this piece of beach artwork here. This art piece also happens to to have a color palette that works very well with colors chosen for our room – you see it it not all about being sentimental! More…. Thanksgiving Wall Decals – Say Thank You in Style!